Step into the tropics, where waves roll majestically and lap at golden sands, rainbows are plentiful and the sun bathes you in warmth. This is the land of Hawaii, and the birthplace of the Kahuna massage. In fact, Kahuna is more than a massage, it’s a deeply nourishing and wonderfully intense system of bodywork, tailored explicitly to the needs of your body. Originally developed in Hawaii to remove blocked energy and to heal underlying issues on all levels, it was used as a rite of passage to enable the chieftains to govern wisely. It was the role of the Hawaiian shaman to carry out this bodywork. ‘Huna’ means ‘secret’ in Hawaiian and encompasses a wide system of bodywork, massage and energy flow. A Kahuna bodywork session involves long, flowing, rhythmic massage strokes. I use my hands, forearms and elbows to perform these massage techniques and focus on areas of the body that need it. Kahuna bodywork concentrates on how the body functions, and the role that energy plays in this. I’m trained to tune in to your physical and emotional needs, without asking you to explain what they are. It’s an intensely spiritual practice and the rhythms of the massage are likened to dancing, said to be inspired by the aloha spirit that is so naturally a part of the beautiful Hawaiian people. A Kahuna massage stimulates many systems of the body, including the lymphatic drainage systems, and that of the heart, lungs and stomach. I develop a close and deep connection when I’m performing a Kahuna massage, with my aim to facilitate your healing by restoring your harmony and balance. By helping you to remove tension, toxins, aches and pains, your natural harmony will return. I begin Kahuna bodywork with a prayer to invite in the highest level of healing, and then perform the massage in silence, only breaking the silence to give thanks at the end. You will benefit from a release of energies, a reduction in stress, an improvement in sleep and a quicker healing of damaged muscles and tissues. Throughout your treatment, you’ll be lifted to a higher plain, feeling like you’re riding gentle and loving waves. I’ll focus on your highest level of healing and will place my total focus on you. I don’t follow a set pattern or sequence, instead I focus on what I can feel that you need and where you need it. 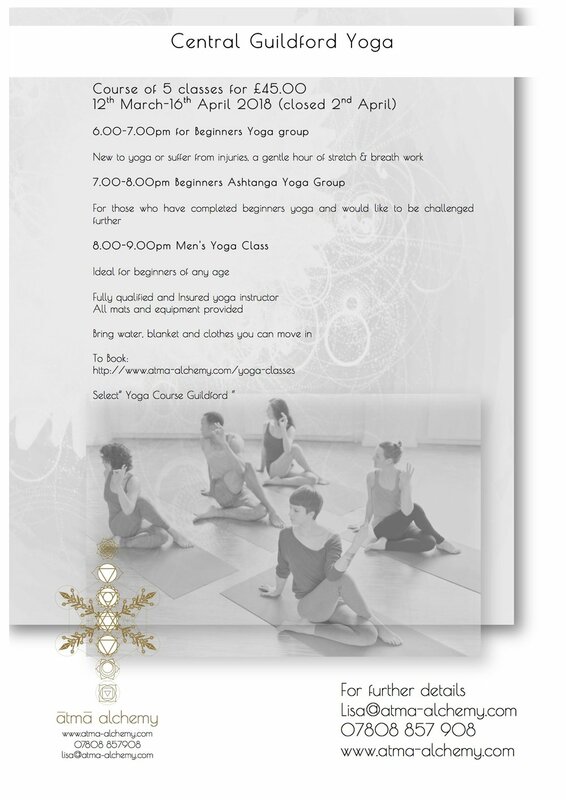 Atma-Alchemy enthusiasm for all things yoga has supported Guildford Rugby Club and advertising for Men's Yoga classes in Guildford & Farnham in their programme s well at private one to one classes. As I previously Blog stated yoga is a complimentary therapy for sports, to add training, well-being and gain greater mental focus its a no brainer for anyone who takes their sports seriously. Many of today’s large-scale western yoga classes are made up of a female majority. Yoga was originally developed in India for the majority of men and some women, but it wasn’t until the early to mid-20th century that Western women started to teach & practice yoga. This movement is attributed to Indra Devi, a devout student of the renowned yoga guru Sri Tirumalai Krishnamacharya. But given the popularity of my new men only yoga class in Farnham, I believe men in the West are beginning to turn to yoga for its mental and physical benefits. Yoga is a beautiful art that has been taught for generations to ensure a long and healthy life and I’m so pleased to be able to offer a men only class. I trained as a yoga instructor in India among many well-respected, amazing and inspirational teachers. These teachers were all from the Ashtanga lineage and can trace their roots back to Krishnamacharya and beyond, their experience and knowledge passed on through each generation. I’m honoured to have learnt from such valued heritage and continue to practice and teach yoga with Indian authenticity, which has the healing of the mind, body and soul at its heart. Giving men a chance to try yoga in the company of other men allows them a space to realise just how flexible they can be. I teach men only classes at a beginner level, very similar to my mixed beginner’s class but with more emphasis on strength. I focus on arm and core strength and areas that need to be stretched and straightened - posture is a big area of concern for all of us, with bad posture caused by driving, sitting at a desk all day and using laptops and mobile phones. In my men’s class, I work on strengthening the back, opening up the chest, shoulders and hip flexors and the hamstrings. Slouching has robbed us all of height, so strengthening the back plays an important role. I also add in some arm balancing exercises, and there have been many who have surprised themselves with how much they can achieve. I’m almost certain that these poses have been demonstrated outside of class, in pubs and on football pitches. The very fact that men can come and enjoy my yoga classes in a non-judgemental space and take their learnings to their colleagues, friends and family members delights me. Each class ends with a savasana, or corpse pose; ten blissful minutes of calm breathing and laying still, completely relaxed. It’s not unusual for students to fall asleep during savasana. I also teach simple poses to carry out at home, so that my students can continue to gain strength and de-stress between classes. The breath leads the way in Ashtanga yoga, and getting the breath right is key to this beautiful art. Over time, perfectly synergistic breathing and movement allows something magical to happen. A seamless moving meditation unfolds, enabling you to learn about yourself and your relationship with this world. You’ll begin to notice you’re more able to focus on work and your home life. My biggest benefit from regular yoga practice has been to become a kinder, more loving person to myself, and to others. I instil the same faith within all of my students – that with yoga there is an absolute connection between mind and body. If you tell yourself that you’re stiff and inflexible, then you will be stiff and inflexible. I encourage positive thoughts first and foremost, and the rest will follow. A better connection between mind and body and a renewed flexibility has profound consequences. Work will become more productive, relationships more rewarding, you’ll be able to reach more fitness goals, recover better and even become more resilient to exercise injury and pain. One of my male students is a keen footballer. Many of his team members have commented on how much his game has improved, and he’s noticed a much stronger core and upper body, with more flexibility. He’s also able to play football three evenings a week without muscle aches and pains. He attributes all of this to regular yoga. Men often experience various aches, pains, and injuries, whether they’re athletically active or spend hours at a desk. Yoga can help prevent injuries in numerous ways. Yoga improves flexibility and range of motion, which helps lengthen muscles and eliminate tightness and strains. Yoga also improves joint durability by strengthening connective muscle tissue. It also gives you better awareness of your body so you can recognize subtle issues, such as poor posture, and correct them quickly. Yoga uses natural body weight and resistance to build lean muscle mass. Yoga lengthens muscles and tissue, which improves blood flow. Better blood flow means more oxygen to the muscles, which helps them recover faster so they can grow. People have improved memory and inhibitory control, which enables them to maintain focus, retain information, make confident work decisions, and have more energy. The meditation aspect of yoga also helps to improve focus. Reduces stress, Anxiety, aid sleep & relaxation. Relaxation, focus, fewer aches and pains, strength and a better game - why not see what yoga can do for you? My classes for men are 8.30-9.30pm at the Seale Village Hall in Farnham and beginning on September 11th 2017, 8-9pm in Quarry Street in Guildford. Pre-booking is essential as I have limited space. I also teach one-to-one classes at my yoga space or in the comfort of your own home. Muddy Stilettos website is working, if you have time please vote for me. Thrilled to report that Atma Alchemy is one of just five finalists in the Muddy Stilettos Awards for Surrey 2017. Thank you to all who voted for me! For the final round, voting starts from zero once more so please, please, vote for me once more. It will only take a click and a minute.